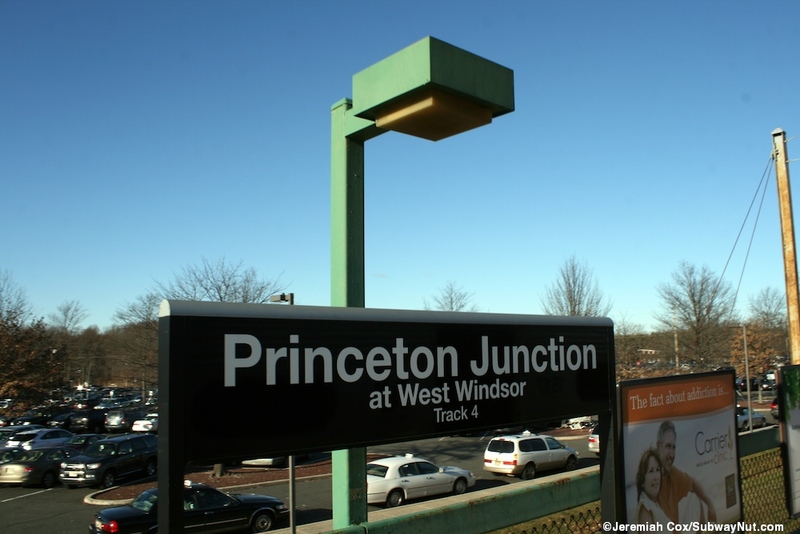 Princeton Junction at West Windsor is a suburban New Jersey Transit Station and the connection point for the Dinky, which is the 1 or 2 car Arrow EMU shuttle train that connects the Northeast Corridor Mainline with Princeton itself 2.7 miles away. 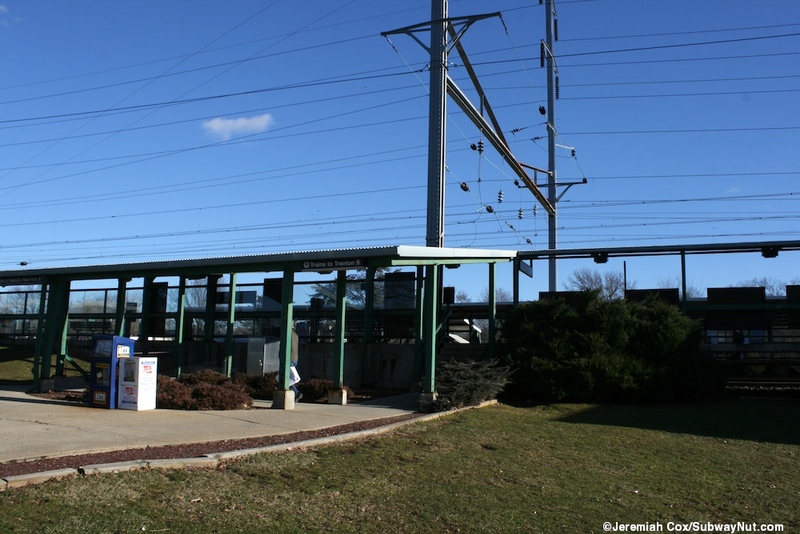 In the present day the suburban station in a sprawling suburb with no walkable development around has become a crucial park & ride location with 8 main parking lots containing more than 3,500 parking spaces, located in a sprawling suburb. 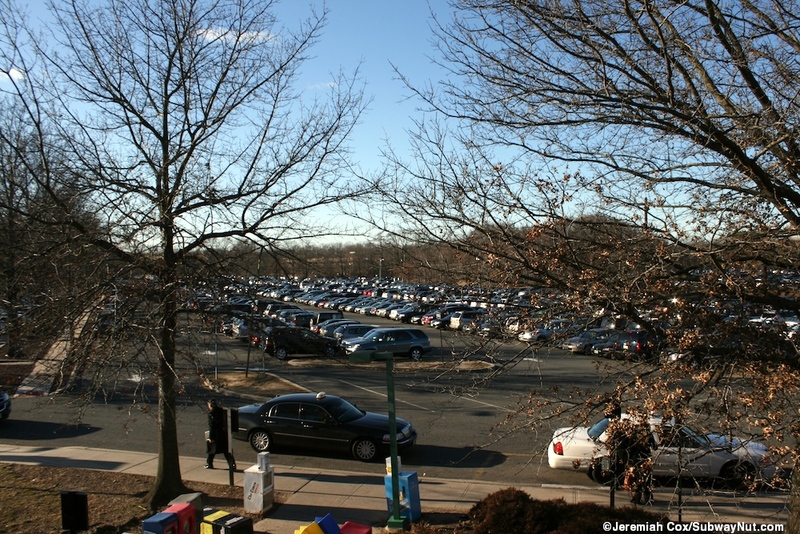 The actual amount of parking is probably closer to 4,000 spaces because of private lots in the area as well. 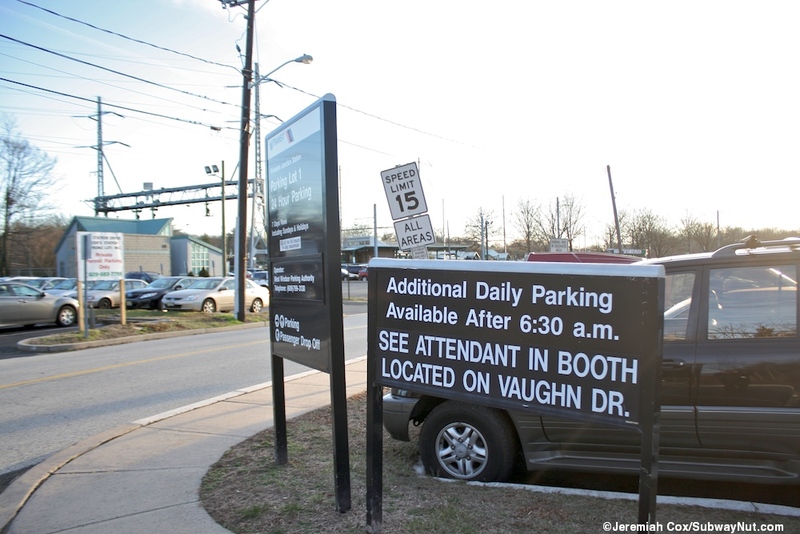 The the main parking lots are controlled by the West Windsor Parking Authority http://www.westwindsorpa.com/ and the permit lots (costing $120 to $195 a quarter) have waiting lists between 4 and 8 years. 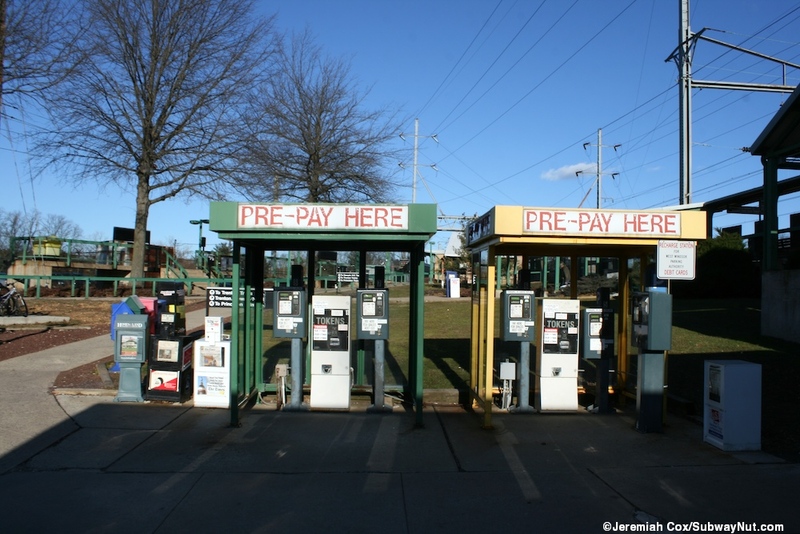 Daily parking costs $5 a day and fills up by 6:30am on weekdays. Shuttle services also connect to suburban office parks around the station. The present modern station buildings and platforms were dedicated in September 1987. 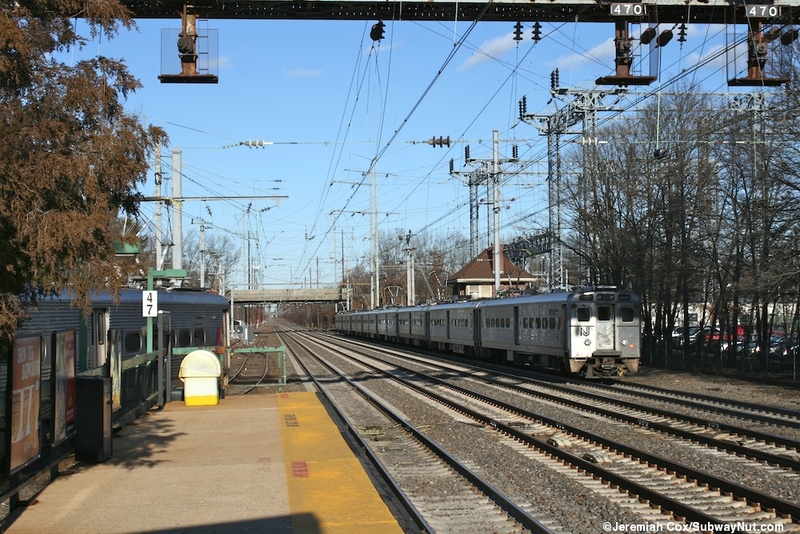 New Jersey Transit train service to the station consists of the Dinky which runs about two trains per hour timed to connect to the mainline Northeast Corridor Line trains which also serve the station about every half-hour with much better rush hour service. 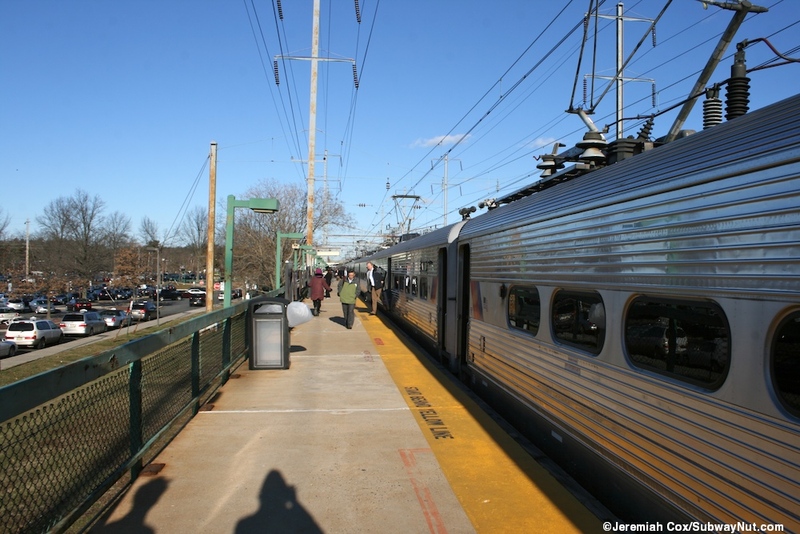 Every New Jersey Transit train that passes through the station stops and rush hour expresses (including a few reverse-peak trips) run non-stop to Newark in as little as 33 minutes, a local train making every stop takes up to 60 minutes to make the trip. 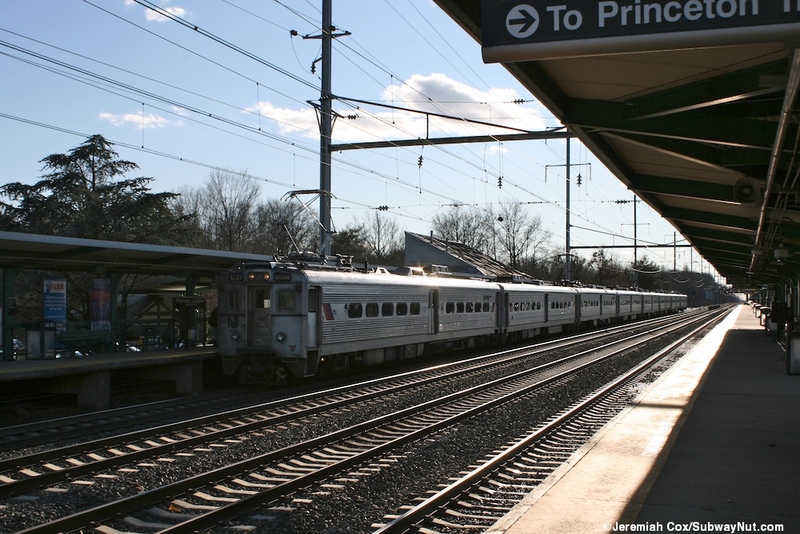 For Amtrak service, the station has probably been the biggest loser caused by the discontinuation of the Clockers (the commuter oriented New York to Philadelphia runs) in 2005. 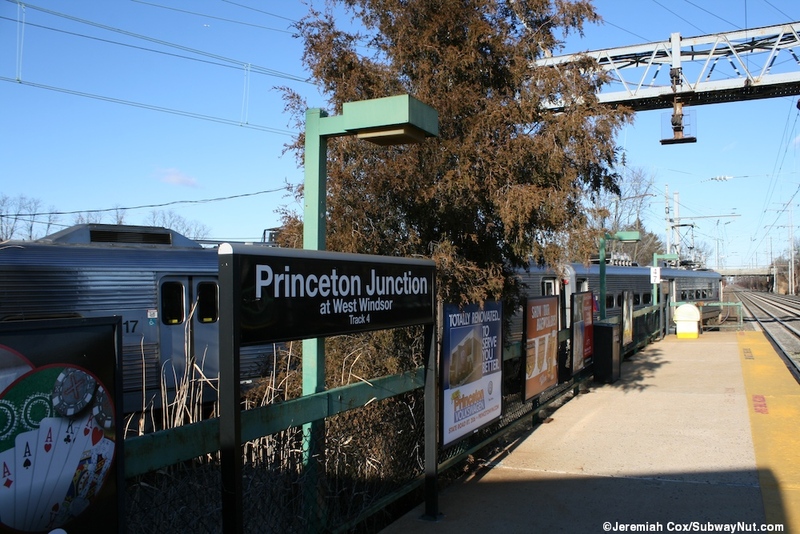 These trains were primarily used by Princeton-bound commuters which accepted their New Jersey Transit monthly passes. Looking at a timetable from 1995 shows between 9 and 10 trains per day stopping including the Pennsylvanian and Carolinian plus a Metroliner. In 1980 it was about 13 trains a day. 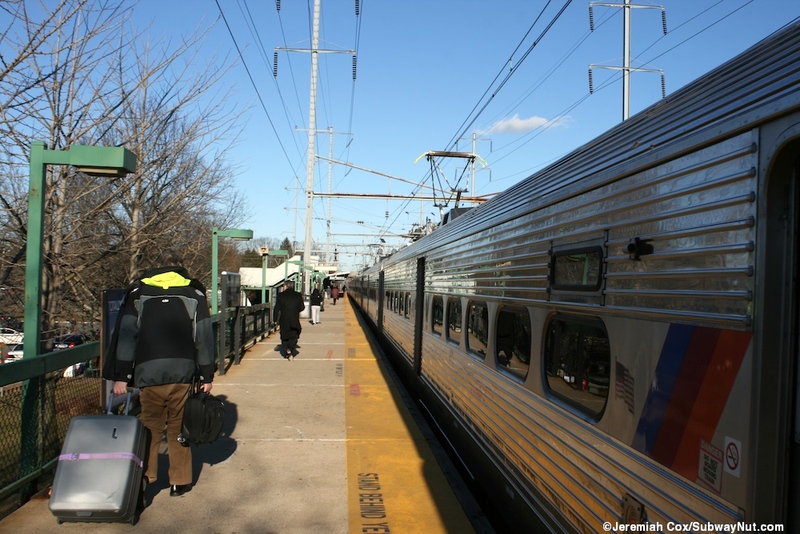 Today Amtrak service is extremely limited; on weekdays just three trains per day: two morning southbound Northeast Regional trains (#111 at 6:16am and #181 at 7:00am) stop bound for Washington, DC and a Keystone train #641 at 8:12 for Harrisburg. Evening northbound trains are:, Keystone #652 at 5:52pm and Northeast Regionals #196 (Monday thru Thursday) or #136 (Friday's extended to Springfield) at 7:39pm and #138 at 8:38pm. Weekend service is provided by just one Keystone train stopping in each direction #663 southbound at 9:58am and #660 northbound at 10:00am. Like New Brunswick Amtrak claims the station is fully staffed but doesn't have its own ticket window, the hours for the ticket office are the same as those for New Jersey Transit (Weekdays 5:15am to 8:00pm, Weekends 7:00am to 3:00pm) so the one ticket office I assume can also process Amtrak reservations (there isn't a sign about this in the office like at NBK). There is also a QuikTrak machine. The station fully rebuilt in the 1980s (before it had two low-level side platforms) has two main high-level side platforms for the four track main which can platform twelve cars, the middle two tracks are for expresses and used by nearly all Amtrak trains to bypass the station. 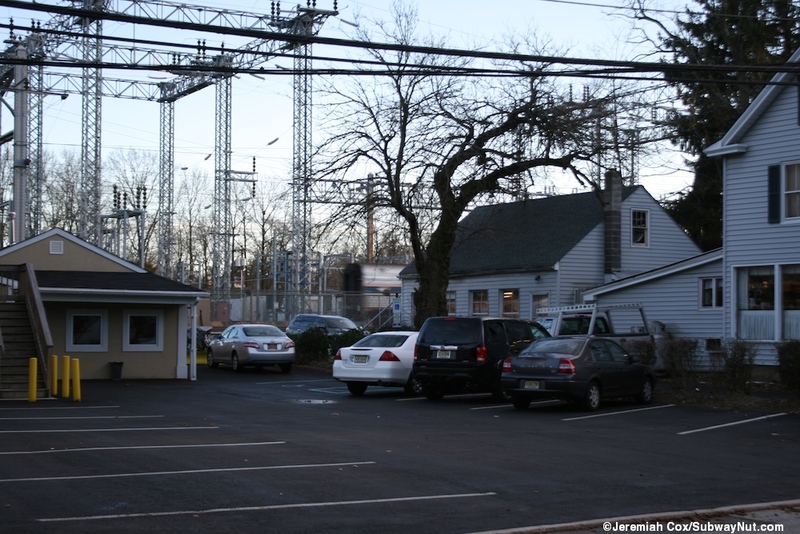 The mainline tracks are on a slight embankment above the surrounding parking lots. There are gated off low-level platforms at the southern end of the station for construction boarding of trains on the middle express tracks when needed. 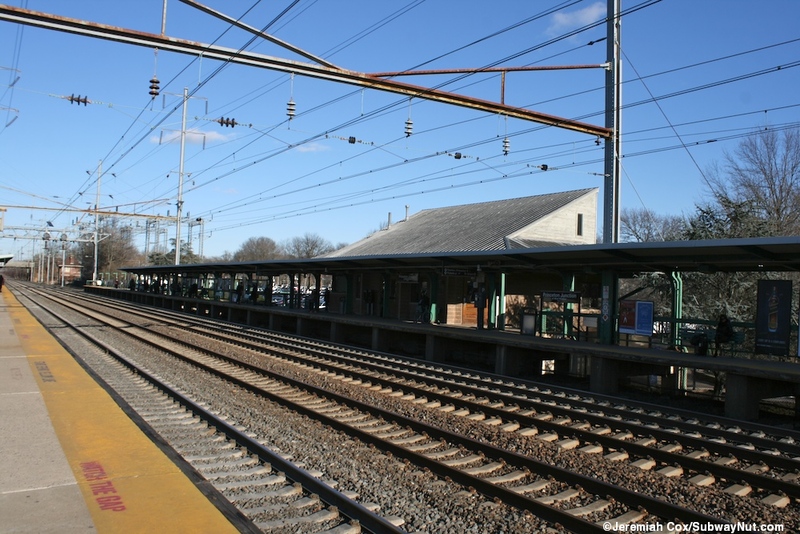 The Dinky's track begins with a siding along the Trenton-bound track and a single switch provides access to this branch from the main tracks of the NEC. 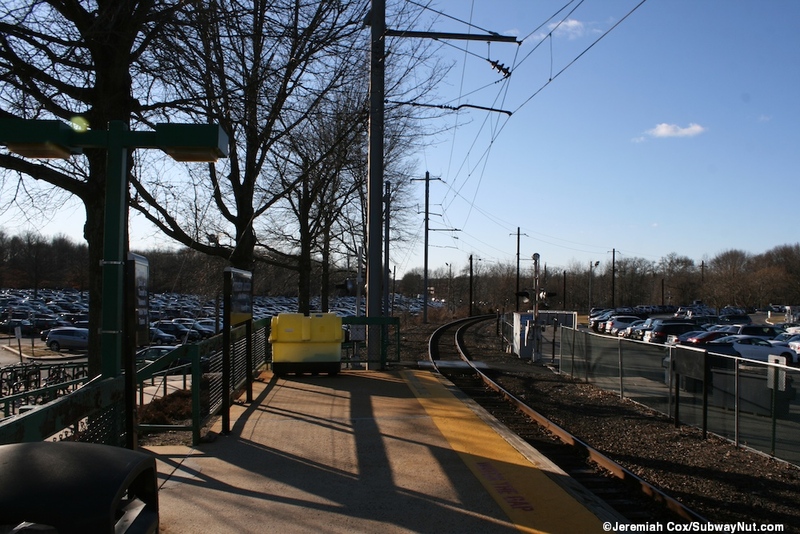 It has a curved 3 car platform that begins at a point near the northern back end of the Trenton-bound platform and extends away from the corridor, the track slowly crosses over the parking lots at a grade to leave the station with both a pedestrian and then a car grade crossing as the branch leaves the station area. All three platforms have modern green lampposts and railings along the platform edges. 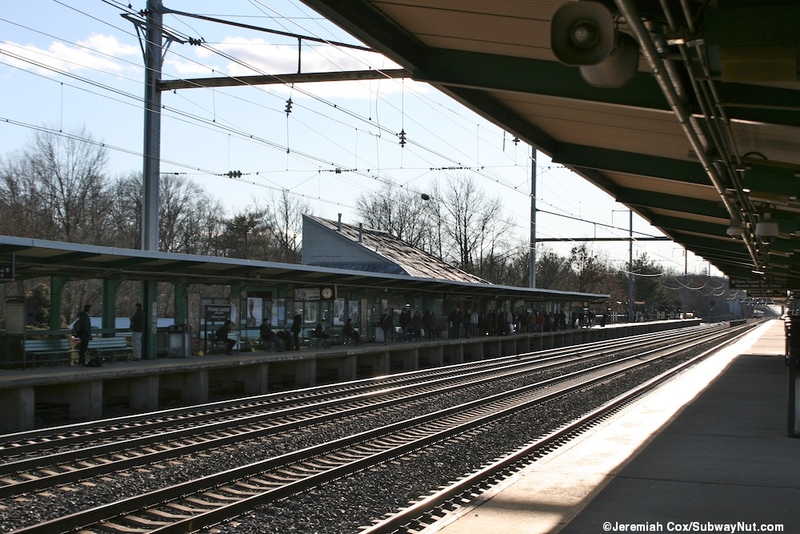 Our tour begins at northern end of the station where the Dinky and Trenton-bound platforms both have canopies and a high-level connection. 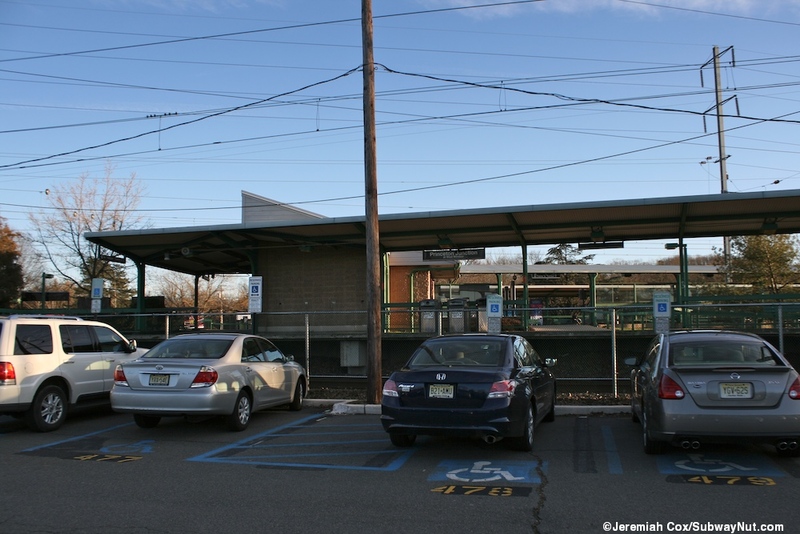 At this point is a small single story concrete building with blue tiled walls and wooden benches inside, a little waiting area for the Dinky and Trenton-bound trains. 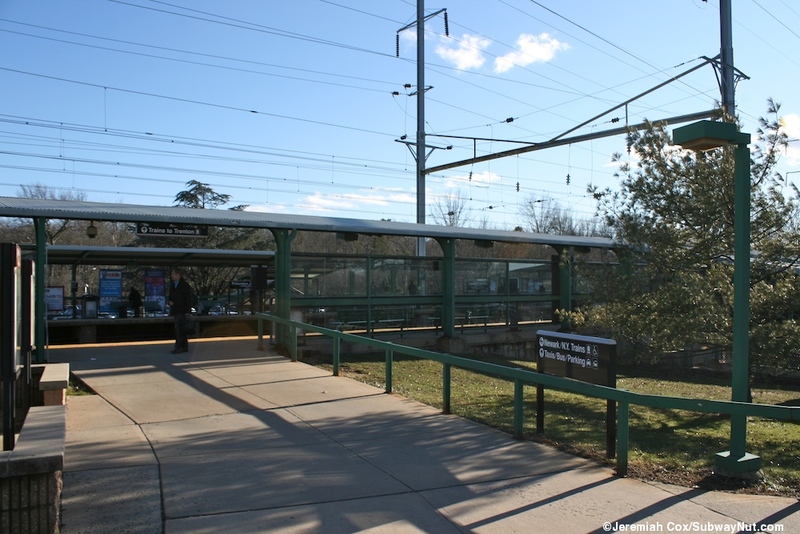 The canopy for the Dinky-bound platform is only right outside of here before it has its own ramp and then staircase as it ends before a pedestrian grade crossing to reach the northern parking lot. 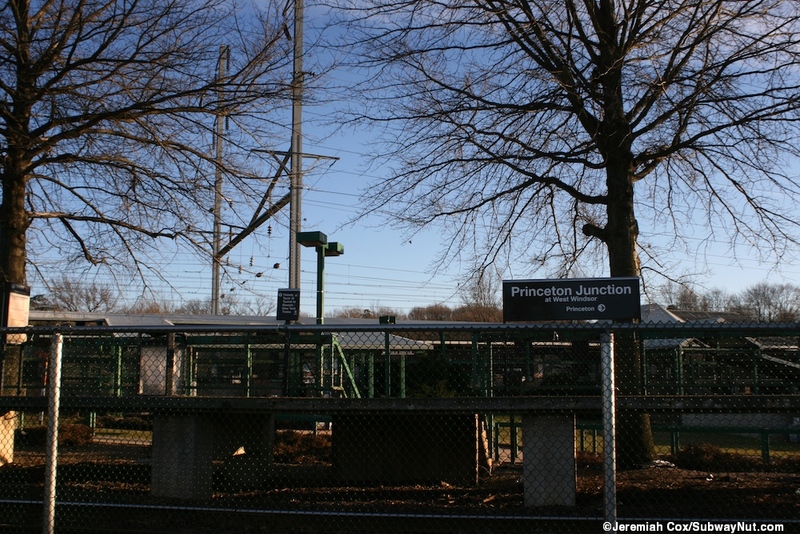 The rest of the Trenton-bound platform is canopied until about a quarter of its length before the canopy ends. Next from the little depot is a ramp down and off the platform followed by two staircases to a simple and slightly dingy original feeling concrete underpass beneath the mainline tracks to reach the New York-bound platform. 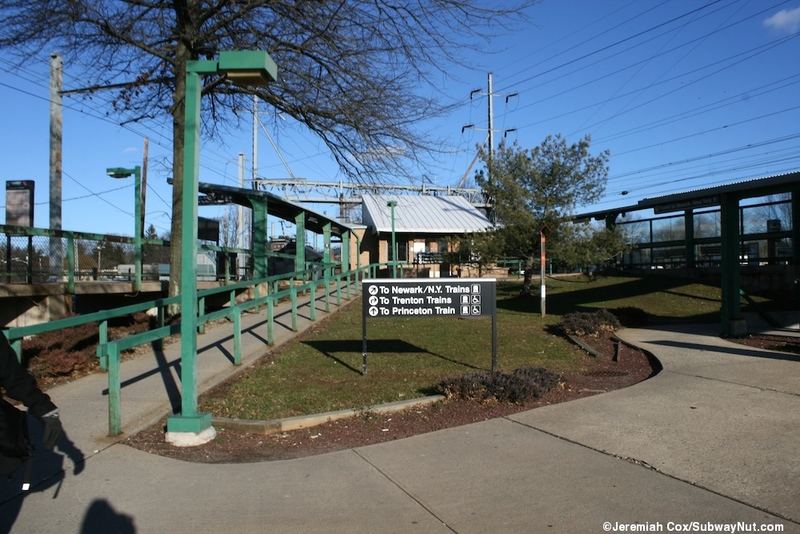 Next are more canopied staircases off the Trenton-bound platform to the second more major tiled underpass (this one has ramp access for ADA compliancy) right at one of the station's bus stops. At this point the canopy along this platform ends and there are two more bare staircases in the middle and at the extreme southern end down to the station's parking lot. The New York-bound platform has the 3 story concrete 1980s designed station house. It is towards the middle of the platform and just south of where the second, nicer overpass is. The public levels are not connected inside. The lower-level consists of Faber's News and Cafe (a convenience store) only accessed from the street. The middle level is the main waiting room access only from the platforms. This includes the ticket office (two possible windows), restrooms, white tiled walls wooden benches and plenty of windows letting sunlight in. 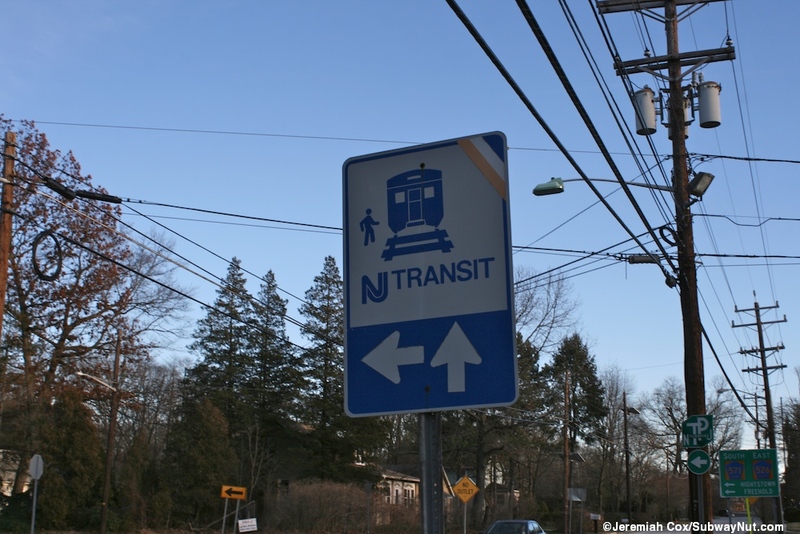 Plaques dedicated the station in memory of Albert R. Hasbrook who wrote the act creating New Jersey Transit in 1979. 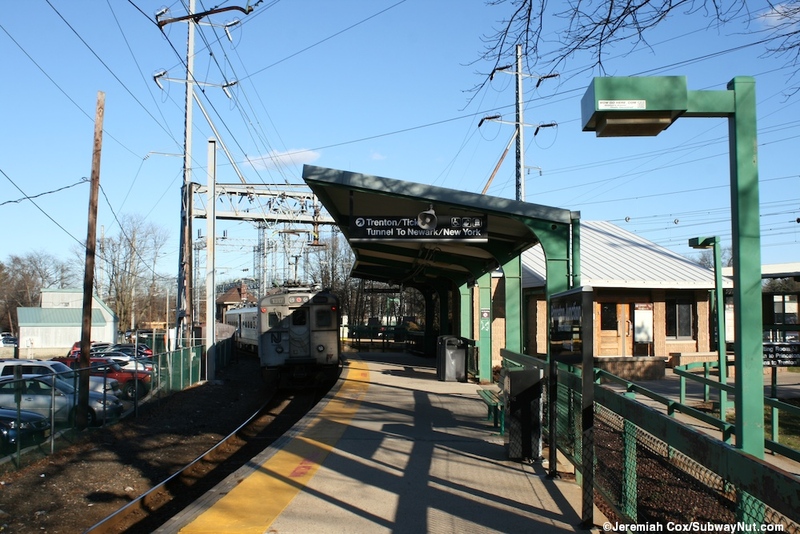 There is one for the dedication of the station, and also one for high-speed rail tests done by the Pennsylvania Railroad and PennCentral in 1967-1969 including reaching speeds between 155.2mph and 160mph. There is a third story not open to the public. The platform is canopied in front of here for about a quarter of its length. Staircases lead off the platform on each side of the depot and there is also a staircase by the northern underpass and a ramp at that end of the station, that wends it's way down to the second underpass.